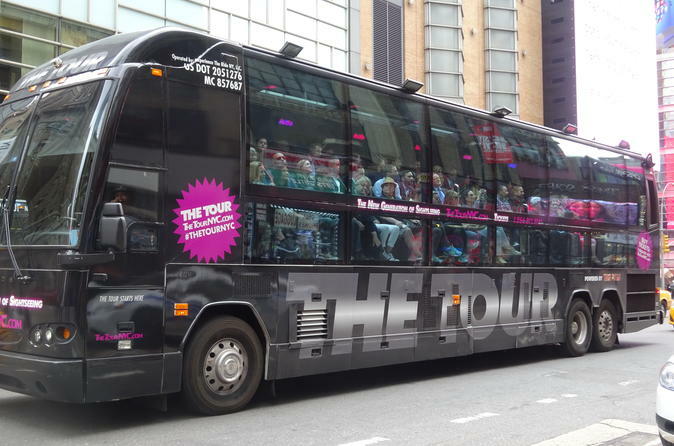 THE TOUR begins at 45th Street and Broadway, where you’ll board a multimillion-dollar, custom-designed coach for a 90-minute New York City sightseeing adventure like no other. The route through Midtown Manhattan and the Upper West Side introduces you to New York neighborhoods and landmarks from the comfort of a climate-controlled motor coach with floor-to-ceiling windows. The stadium-style, side-facing seats keep you from craning your neck to view the sights, while multimedia technology — including 3,000 LED lights, 40 plasma TV screens and surround sound — enhances your experience. Watch city landmarks unfold before your eyes, including Times Square, the Broadway District, Columbus Circle, Lincoln Center, Central Park, 5th Avenue, Rockefeller Center, Radio City Music Hall, the Garment District, Empire State Building, Madison Avenue, New York Public Library, Bryant Park and 42nd Street. Your journey is augmented by audio-visuals conveying the history and growth of Manhattan, with some exciting surprises along the way. See and hear about New York’s past, present and future via interactive displays and live narration from your knowledgeable tour Navigator. THE TOUR ends at 46th Street and Broadway, where you can disembark to continuing exploring the city on your own.